When you think of an all wheel drive rally car for the road, you think of an Audi Quattro, or a Subaru WRX, or a Mitsubishi Evo. 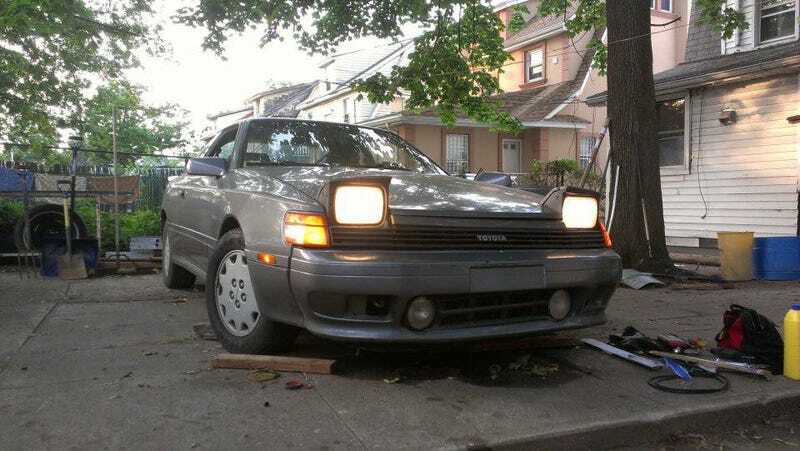 You do not think of a grey 1988 Toyota Celica. But that’s exactly what we have here. This is a Toyota Celica Alltrac. It was the homologation special for the start of Toyota’s extremely cheatey success in the World Rally Championship. Performance is, uh, perhaps not exactly what you would expect from a modern rally special, with less than 200 horsepower from its turbo two-liter four. It is, however, one of the coolest looking cars ever made. This generation of Toyota Celica, believe it or not, was actually designed to resemble an obscure 1960s French performance car, the Panhard 24ct. This one is in decent shape for a terrifyingly affordable price. The body looks clean, and the only thing the seller says the thing needs is a new clutch. It looks like the price is low mostly because nobody knows about these forgotten AWD Celicas. Please buy it so I don’t spend more money I don’t have on another car I don’t need. Find the Craigslist listing for the car in New York City right here.